Jail Guitar Doors are back on the road! We are pleased to announce a number of dates in July, which include a screening of the Jail Guitar Doors documentary "Breaking Rocks"
In addition to the screening, there will be an introduction to the fiilm by Alan Miles (Director), Q&A's from Billy Bragg and Alan Miles and performances from Billy Bragg and Jail Guitar Doors artists including Jonny Neesom and Leon Walker. Come down and show your support for Jail Guitar Doors and listen to some great music. See you there! 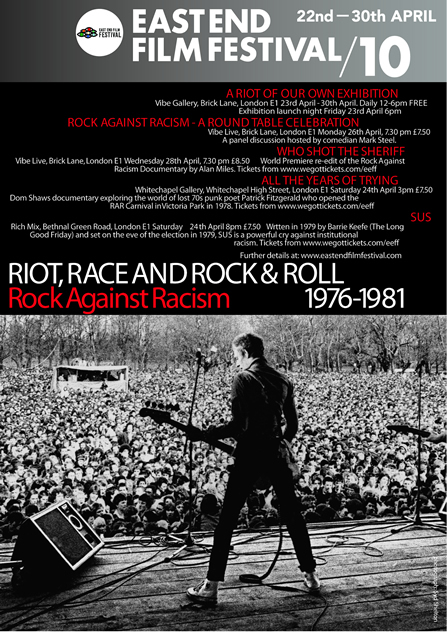 This years East End Film Festival includes the Rock Against Racism documentry, directed by Alan Miles, of Breaking Rocks fame. Try and make it down to at least obne of the events. It's all for a good cause! There are still some tickets left for Sunday evenings London JGD gig at the Prince Charles Theatre. In addition to the screening of "Breaking Rocks" there will be Q&A's from Billy Bragg and Alan Miles and performances from Jail Guitar Doors artists including Jonny Neesom and Leon Walker. Come down and show your support for Jail Guitar Doors and listen to some great music. See you there! We are pleased to announce that we now have an official group page set up on Facebook. Later this week the link will be up here on the website, in the meantime, please go to Facebook and type in Jail Guitar Doors and look for the page with Billy Bragg as the Admin. Dont forget to spread the word! Thanks. With the new year underway, we are pleased to announce a short tour that will be running throughout February 2010. In addition to the screening of "Breaking Rocks" there will be Q&A's from Billy Bragg and Alan Miles and performances from Jail Guitar Doors artists including Jonny Neesom and Leon Walker. Please try and make it down to show your support for Jail Guitar Doors and listen to some great music. Gifted and talented are just a couple of words to describe Tom McRae. Tom recently wrote in his blog about when he was asked by us if he would play a few songs for some inmates at a Young Offenders Institute in Wetherby, Yorkshire. scroll down to the 1st November 2009 blog entry. Militant Entertainment presents an evening celebrating the life of Joe Strummer, at the Flowerpot in Kentish Town on Tuesday 22nd December 09. We have some dates for your diary as Jail Guitar Doors is on the road in December. .
01 Dec - merc instore @ 7.00pm with Sam Duckworth (GCWCF), Kieron Leonard, Alan Miles, Jonny Neesom and Leon Walker. merc is at: 10 Carnaby St, London W1F 9PF. Sscreening of JGD "Breaking Rocks" documentary with Q&A and songs by Jonny Neesom and Leon Walker plus very special guests. We are pleased to announce that the Jail Guitar Doors documentary "Breaking Rocks" will be hitting the road in Feb 2010 for a nationwide tour. We will announce more news as dates are confirmed but we will be touring up and down the UK and there will be Q & A's and performances from Jail Guitar Doors artists plus surprise guests, so keep checking in for more news. Tanglewood, the UK ’s number one brand of acoustic guitars are proud to be supplying Jail Guitar Doors with instruments. Tanglewood's Steve Gamble, said at the recent "Breaking Rockls" screening at the Prince Charles Cinema “We at Tanglewood are very aware of the positive benefits that music can have and are constantly looking for new ways to promote music education. Jail Guitar Doors are already proving their worth and we look forward to supporting them in the future”. 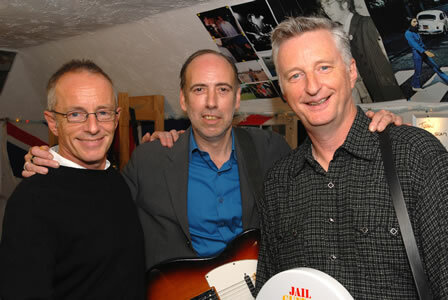 Billy Bragg commented, "Tanglewood's sponsorship of Jail Guitar Doors raises our game to another level. will help us to reach out to more prisons around the UK". Unfortunately, the screening of the Jail Guitar Doors documentary "Breaking Rocks" The Shortwave Cinema, 10 Bermondsey Square, London SE1 3UN on Sunday 22nd November 2009 has been cancelled. Please check back to us as we will update the site when the new date is arranged. The pictures from the PRince Charles Cinema screening of "Breaking Rock" are now in the JGD Gallery. Please take a look where you can buy Jail Guitar Doors related merchandise including T Shirts, Posters, CD's and Badges. All proceeds from our store go towards supporting and promoting our work so thanks in advance for buying some goodies and helping us to continue our work. Go on then, what are you waiting for, go get yourself a nice T Shirt!! We are pleased to announce that the Jail Guitar Doors web store is now online within the site. We have finally launched our new gallery within the site. Please take a look where you can see photos from our journey to date including pictures from the Flowerpot gig in Camden and more recently the "Breaking Rocks" premiere at the Proud Gallery. We will also be launching our on line store any day now where you will be able to buy Jail Guitar Doors merchandise including T Shirts, Posters, CD's and Badges. Check back soon. The world premiere of Breaking Rocks, Alan Miles' documentary about Jail Guitar Doors, screened in London on Thursday 1st October 2009 as part of the 17th Raindance Film Festival. 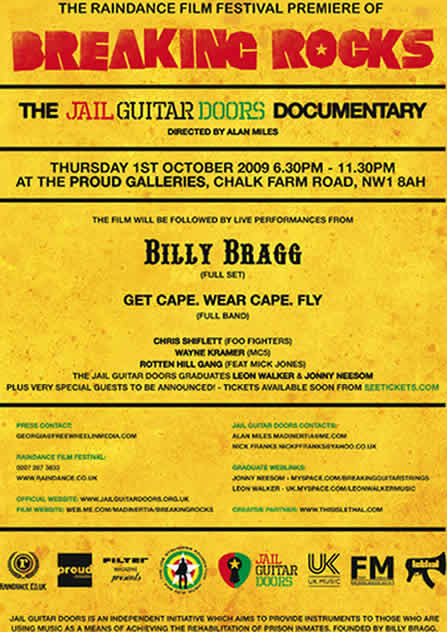 The screening, which took place at Proud Galleries, Camden, was followed by very special performances by Jail Guitar Doors graduates Jonny Neesom, Leon Walker, special guests Chris Shiflett from The Foo Fighters, Get Cape. Wear Cape. Fly., and JGD founder Billy Bragg, playing a highly charged set. Bragg was joined on stage for the finale by the MC5's Wayne Kramer - who will be taking Jail Guitar Doors in to U.S. prisons, the legendary Mick Jones of The Clash and Chris Shiflett for renditions of Kick Out The Jams and, of course, Jail Guitar Doors. Many thanks to all who supported the event, onstage and off, who made the night a truly exceptional and unique evening. With only two days to go until the "Breaking Rocks" film premiere and concert at the Proud Galleries in Camden, London, tickets are selling fast. This will certainly be a night to remember so please come along. there will be £10 tickets available on the night for the concert only. 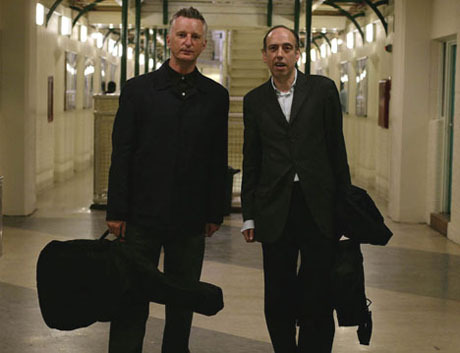 Legendary Clash members Mick Jones and Topper Headon were reunited in the studio for the first time in 27 years when they joined Billy Bragg for a recording aimed at promoting the folk singer’s Jail Guitar Doors campaign. Started two years ago, the Jail Guitar Doors initiative helps to supply musical instruments to prison inmates, to aid with their rehabilitation, and has so far seen several ‘graduates’ of the scheme pursue careers as performers after their release from jail. Bragg, Jones and Headon were backed by a band comprising former inmates Leon Walker, Jonny Neesom, Kevin Hawkins and Jon Smillie on a spirited re-recording of the 1978 Clash song Jail Guitar Doors, from which the campaign takes its name. The recording session was filmed for Alan Miles’ ‘Breaking Rocks’, a gritty and uplifting documentary about the Jail Guitar Doors initiative, which will be premiered as part of the Raindance film festival at Proud Gallery, Camden Town on 1 October. The film will be followed by performances from Billy Bragg, Mick Jones, the MC5’s Wayne Kramer, Chris Shiflett of Foo Fighters, Get Cape Wear Cape Fly, Jail Guitar Doors graduates Leon Walker, Jonny Neesom, Louise Wells and Theone Coleman, plus Night of Treason. Jail Guitar Doors documentary "Breaking Rocks" will be screened at The Prince Charles Cinema, just off Leicester Sq, London on Wednesday 28th October 2009. The screening will be followed by a Q&A with Billy Bragg, Alan Miles (director) plus JGD graduates Jonny Neesom & Leon Walker. 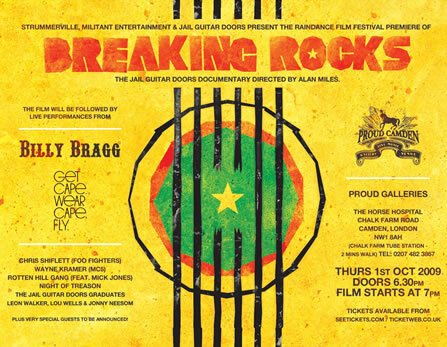 Jail Guitar Doors documentary "Breaking Rocks" will have it's World Premiere at The Raindance Film Festival on Thursday 1st October 2009 at the Proud Galleries, based in Camden. The premiere will be followed by a live concert with Billy Bragg, Get Cape. Wear Cape Fly and many special guests. The night will be accompanied by the punky/reggae sound system Radio Clash, who will be looking after the decks on the night. The full list of special guests will be announced closer to the date. Jail Guitar Doors are pleased to announce the forthcoming release of "Breaking Rocks". This inspiring documentary tells the story of Jail Guitar Doors, Billy Bragg's independent initiative which aims to provide instruments to those who are using music as a means of achieving the rehabilitation of prison inmates. Directed by Alan Miles, "Breaking Rocks" features performances by 'graduates' from Jail Guitar Doors as well as from many of the artists that have supported the programme including Mick Jones (The Clash) Chris Shiflett (Foo Fighters) Sam Duckworth (Get Cape. Wear Cape. 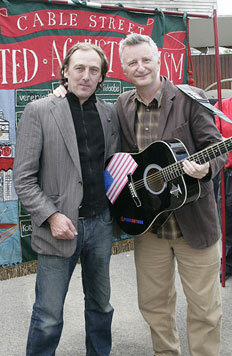 Fly) and Billy Bragg himself. Further announcements on release dates and preview screenings will be added to this site ongoing. A tribute night for legendary Clash front man Joe Strummer will be held at the Grove Tavern in South Wimbledon on Saturday, 25 April 2009 as a fundraiser for Billy's Jail Guitar Doors project. Headliners are Night of Treason - the UK's self-styled "Guv'nors of Punk" - saluting The Clash and many other artists and capturing the spirit of 1977. Special guests will be announced closer to the date and the punky/reggae sound system Radio Clash will be looking after the decks. 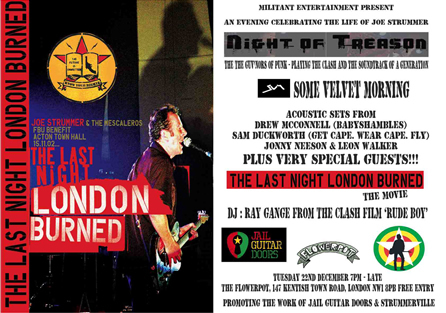 There will also be a special showing of the unreleased documentary "The Last Night London Burned" - featuring Joe's last ever London gig in support of the striking firefighters and unique footage of Strummer being reunited on stage with Mick Jones for the first time in 20 years. Geoff Martin, who works with Billy on Jail Guitar Doors as well as being the former council member for South Wimbledon, said: "No one should ever underestimate the lasting legacy of Joe Strummer and the Clash. Joe's spirit, energy and love of humanity is as relevant today as it ever was and that's why we keep the flame burning bright." The Guardian newspaper published a feature article on Jail Guitar Doors, on 10 December 2008. When Billy Bragg received a letter from Malcolm Dudley, a drugs and alcohol worker at Guys Marsh prison, in Dorset, telling him he wanted to start guitar classes but didn't have any guitars the men could practise with between classes, the singer-songwriter wanted to help. Bragg was looking for a way to commemorate the anniversary of the death of Joe Strummer, the lead singer of the Clash, who died on December 22, 2002. "Every now and then something comes along that you can clearly see will make a difference," Bragg says. "I looked at this, and thought: 'Yeah.'" Billy will be hosting a free songwriters' hootenanny as part of his Jail Guitar Doors initiative in the Gaslight Club in Hornsey, London, on Sunday, 1 March 2009. Billy says: "Jail Guitar Doors has been providing instruments to prisons across Britain for more than two years now and some of the songwriters who have developed their skills as part of our project have now been released. "We want to provide them with an opportunity to perform their songs in a supportive atmosphere in the hope of encouraging them to continue to use song-writing as a means of processing their problems in a non-confrontational way." The first hootenanny will feature performances from Billy Bragg, singer-songwriter Kieran Leonard, and former prisoner Johnny Neesom, who took part in the first Jail Guitars Doors project at HMP Guys Marsh. The event, which will be held every month, will see all three songwriters sitting together on stage, taking turns to perform their songs. There will also be a brief screening of footage outlining the work that Jail Guitar Doors does in Britain’s prisons. The Gaslight is at the Wishing Well, 5 Tottenham Lane, Hornsey, London N8 9DJ. Admission is free and doors open at 7.30pm. The Gaslight a small room, so come early to avoid disappointment - first come, first served. 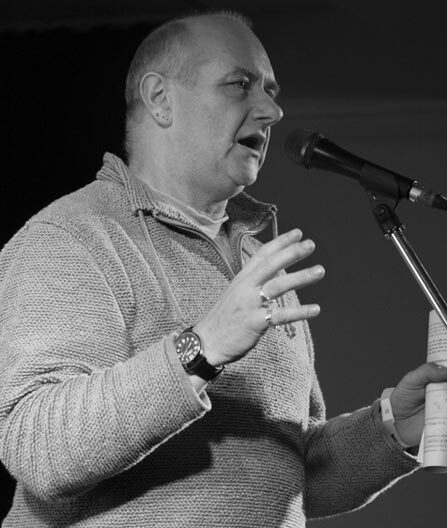 Billy writes: "I am sorry to have to announce the sudden death of our friend, Malcolm Dudley (pictured below), who provided the spark that ignited this campaign. "A warm and compassionate man, he was a great believer in the power of music to change people’s lives and his vision will continue to inspire all of us who worked with him through Jail Guitar Doors. He died on Boxing Day of a massive heart attack aged 56. A dedicated husband and father, he leaves a wife and two children. Our thoughts are with them." After spending a day in Brixton Prison holding guitar workshops and doing a gig, Dirty Pretty Things, John McLure, Kieran Leonard and Billy Bragg reconvened at the Round Chapel in Hackney, east London to play an end-of-year fund-raiser for Jail Guitar Doors. Also on the bill was Johnny Neesom, from the Guys Marsh Prison guitar group. The ensemble were joined onstage at the end of the night by Mick Jones who led them through a rousing version of ‘Jail Guitar Doors’. Our sponsors, Gibson Musical Instruments, played host on 26 November to a screening of a new cut of the Jail Guitar Doors documentary which has been shot over the past 18 months by filmmaker Alan Miles. Following the screening, a number of people spoke, including Paul McDowell, the governor of Brixton Prison, who said that the introduction of instruments by Jail Guitar Doors has changed the atmosphere in the prison. Malcolm Dudley, whose project at HMP Guys Marsh was the spark that led to our campaign, also spoke and introduced us to a former member of his guitar class at the prison, Johnny Neesom, who played a powerful song about his incarceration in Guys Marsh. This was followed by performances from John McLure of Rev & the Makers, Sam Duckworth of Get Cape, Wear Cape, Fly, the Mentalists and Billy Bragg. Theone Coleman has received a Young Achiever of the Year Award from the Prince's Trust. Theone, a former Guys Marsh inmate who accompanied Malcolm Dudley to Glastonbury last year and won over the audience with a song he wrote in the prison, was given the award for his work in creating and running a youth music project in Bournemouth. Our recent donation of guitars and musical equipment to Northallerton YOI in Yorkshire was funded by donations made in memory of Mark Ellis. Mark was a Probation Officer based in Barnsley who worked in the Yorkshire area who tragically died in February of this year aged 41. Mark worked tirelessly for his clients, often doing visits beyond his normal hours and fighting their corner. He was a massive music fan and DJ - a love of obscure ska and punk gave him the nickname of "B-Side Mark". Mark's attitude to trying to make a difference was also reflected in his love of the music of The Clash/Billy Bragg/The Smiths. It was for this reason that Mark's family and friends wanted to remember him by donating cash raised to Jail Guitar Doors which reflected his love of music, his probationary work, but mostly his positive attitude to making a difference. Jail Guitar Doors made donations to four prisons in the north of England over two hectic days in September. HMP Wymott, near Preston in Lancashire, was the first to benefit, followed by Wetherby, a Youth Offender Institute in Yorkshire, Askham Grange, a women’s prison just outside York and Northallerton, another Yorkshire YOI. Askham Grange was also the recipient of a full drum kit, donated by Maggie Eisner in memory of her daughter Colleen. In her dedication of the kit Maggie said: "Colleen had a difficult start in life and we adopted her when she was three. She was very musical. She was a fine drummer, but most of all she loved to sing. Hearing her beautiful voice could make your spine tingle. Sadly, she had mental health problems and died in January 2008. She would have been very happy to know that her drum kit will help women in prison. Play it loud and proud!" Two members of East London Running Club, Forest Gate Strollers, tackled the London Marathon to raise money for Jail Guitar Doors. Angus Forbes and Neil Larkin handed over £1,500. 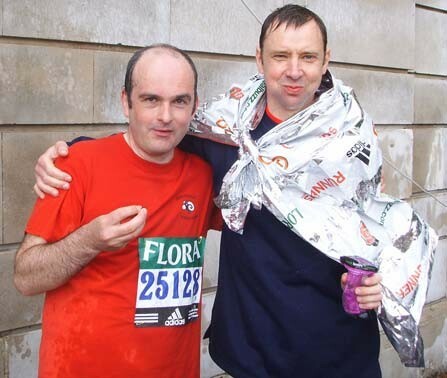 Neil and Angus (pictured, below) were supported in their efforts by other club members and friends who organised a Jail Guitar Doors musical evening at BB’s Dance Club in Forest Gate to support their running efforts. After completing the marathon in 4 hours 19 minutes, Angus said: "It was a fantastic experience and we are delighted at the support that has been shown to us by friends and our local community." Neil Larkin, who completed in 3:36, added: "We were proud to run for a progressive cause rather than a typical charity. Organising the party was far easier than doing the run!" Peter Dunwell is a professional photographer who has been taking pictures of Billy at gigs over the past few years. At Lincoln, on the last night of the recent UK tour, Peter turned up with a framed copy of one of his photos of Billy, which he donated to raise funds for Jail Guitar Doors. Offers were made at the T-shirt stall all night and the winning bid of £200 came from Martin Yates. Thanks to both Peter (pictured left with Billy) and Martin (centre) for their support. “During our tour, Jem (Finer, the Pogues banjo player) suggested to me that I should put my stage-suit on Ebay to see how much I could get for it, the state of it deplorably sorry, the knees all gone, the groin ripped by some protrusion on the backside of my accordion. So I put it up for auction, the proceeds to go, as I declared in the description of the suit on Ebay, to Jail Guitar Doors,” said James. After fierce bidding, the lot, which included three AAA passes from the Pogues USA West Coast, England at Christmas and the March tour - throughout which James wore the suit - eventually raised £193.50, dry cleaning bill not included. Jail Guitar Doors supplied six acoustic guitars, one electric guitar and an electric bass as part of a three day song-writing workshop at the largest prison in western Europe, Walton Prison in Liverpool. In a special event as part of the Liverpool European City of Culture celebrations, Billy collaborated with Delia Brady-Jacobs of Big House Arts and other local musicians, composing songs with inmates, the whole thing culminating in a concert at the prison. Epiphone, part of Gibson guitars, has become a sponsor of Jail Guitar Doors. One of the world's greatest guitar manufacturers, Gibson in London will be supplying JGD with instruments from the Epiphone range, mostly Dreadnought acoustic guitars and Les Paul II electric guitars at very reasonable prices. 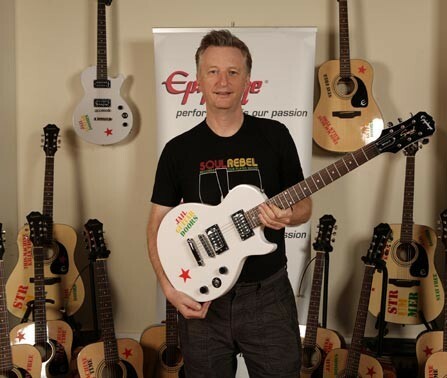 Billy (pictured, below, with the guitars) said: "I'm very excited at the prospect of working with Epiphone. Music therapy has been shown to make a significant contribution towards rehabilitation and the supply of quality instruments that Epiphone has made available will help to enhance the work being carried out in Britain's prisons." The first batch of new Epiphone guitars have been donated to HMP Liverpool. The Independent newspaper published a feature on the Jail Guitar Doors campaign in its issue on Saturday, 12 January 2008. 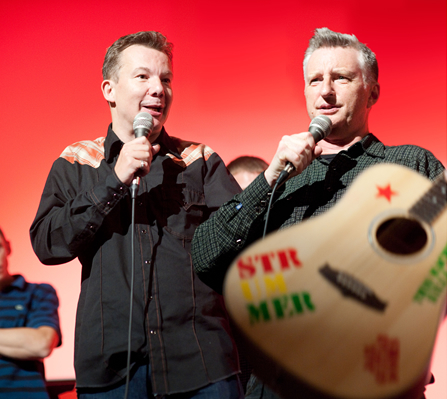 Journalist Nick Duerden followed Billy Bragg on a visit to Styal prison in Wilmslow, near Manchester, and interviewed him over a curry later. On a makeshift stage that, on any other day, is merely storage space within a cavernous gym hall, a band called the Meerkatz are halfway through a spirited rendition of "Do They Know It's Christmas?". The singer – a healthcare worker by day here at Styal women's prison in Wilmslow, near Manchester – gurns his way through the song as if it were a bowel movement. But if the crowd seems more appreciative than one would expect of an audience at three o'clock on a freezing winter's afternoon, it's because it is made up exclusively of inmates who would otherwise be doing, according to prisoner Adele, "boring stuff like learning how to read and write". Seventy guitars were purchased and distributed in 2007 by Jail Guitar Doors along with 12 keyboards, two full drum-kits, four electric guitars, four basses, a mixing desk and various percussion instruments. We would like to thank all those whose donations enabled us to assist in rehabilitation programmes in HMP’s Guys Marsh, Wormwood Scrubs, Shepton Mallet, Reading, Bronzefield, Edinburgh, Wandsworth, The Verne, Lancaster Castle, Pentonville, Stocken and Styal. Let The People Decide is a seven-track live album charting Reading band 'My Luminaries' last year of touring across the UK and Europe. It is a download-only release, which can be bought via a donation at the buyer's discretion. Fifty per cent of proceeds go straight back into the Reading branch of the Jail Guitar Doors campaign, following on from this year's festival at the Fez Club, which raised £2,000 to buy musical instruments for inmates at HMP Reading Young Offender's Institute. Funds raised from this album are essential to putting the campaign's previous results into action through in-prison tuition, workshops, prisoner led concerts and much more. Jail Guitar Doors made its final donation of 2007 to Britain’s largest women’s prison, delivering £1,669 worth of instruments to HMP Styal in Cheshire. The equipment was bought with the proceeds of the last September’s ‘Symphony-a-thon’ sponsored classical concert organised by Catherine Rose. The equipment included two Yamaha electronic keyboards, a drum-kit, six Spanish-style acoustic guitars as well as an electric guitar and bass. HMP Stocken in Rutland became the latest prison to benefit from the Jail Guitar Doors initiative when local band Eastroad delivered half a dozen guitars there last night. The band, along with solo performer Simon Cornish, played a show for the inmates after handing over instruments that they themselves had sourced from John Hornby Skewes & Co in Leeds, who showed their support for JGD by letting us have the guitars at a very reasonable price. Billy and Mick Jones teamed up again today to deliver six guitars, a full drum kit and various items of percussion to HMP Pentonville in north London. The equipment was purchased with funds donated by top young band The Enemy, who approached Billy about getting some guitars into the prison after they played a gig there last month. Afterwards, Bragg and Jones dashed across town to help inaugurate the new prison radio project at Brixton Prison. Members of Primal Scream, Oasis, the Alabama 3, Carter USM, The Happy Mondays, The Smiths, Paul Weller's band and legendary punk outfit The Members will come together in Brixton on the night of 22 December 2007 to mark the fifth anniversary of Joe Strummer's death and to celebrate the Clash front man's life and legacy. The show at JAMM on Brixton Road - raising money for the Strummerville Foundation, Jail Guitar Doors and RAR08 - will also feature new bands The Mentalists and The Misfits, with Jamie T and other special guests also expected to make an appearance on the night. The Strummerville Collective will be coming together to perform some of the greatest Clash songs for what will be a unique rock and roll experience in memory of Joe. Mani from Primal Scream, Bonehead from Oasis, Bez from the Happy Mondays, Larry Love from the Alabama 3, Nigel Clarke from Dodgy and Alan White from Paul Weller's band hope to raise enough money to supply instruments for Brixton prison. Let The People Decide is a 7- track live album charting Reading band My Luminaries last year of touring across the UK and Europe. It is a download-only release, which can be purchased via a donation of the buyers discretion. Fifty per cent of proceeds go straight back into the Reading branch of Jail Guitar Doors, following on from this year's festival at the Fez Club, which raised £2,000 to buy musical instruments for inmates at HMP Reading Young Offenders Institute. Billy recently appeared at the Arms Aloft in Acton gig celebrating the life of Joe Strummer. The event was a commemoration of Joe's last London gig, at which he raised money for the Fire Brigades Union, which was then on strike. A decorated acoustic guitar was raffled and part of the bar take was donated to Jail Guitar Doors. The good people from Philosophy Football, who have been selling Clash-inspired T-shirts as a benefit for JGD also used the occasion to present us with a cheque for £250. When all this was added together Jail Guitar Doors benefited to the tune of £1,191. Thanks to the FBU for organising the donation and for everyone involved with the event for their support. Billy today delivered four acoustic guitars to The Verne, a prison from the Napoleonic period, where the charity Live Music Now is conducting workshops with the inmates. Billy's gig at this year's Labour Party Conference saw £3,500 raised by raffling one of the Jail Guitar Doors-decorated acoustic guitars. Money from the raffle was supplemented by donations from the GMB, the National Union of Mineworkers, Thompsons Solicitors, and, in a welcome show of support for our initiative, the Prison Officers Association, who donated £500 to the cause. A group of classical musicians got together for a special ‘Symphony-a-thon’ to raise cash for Billy's Jail Guitar Doors initiative on 22 September. Twenty-two players performed as a scratch orchestra at St Peter and Paul’s Church in Olney, Buckinghamshire, to play a series of chamber symphonies. Conducted by Michael Rose and Catherine Rose, the orchestra played for five hours from 10.30 in the morning. The event, which was organised by Catherine, has so far raised £1,398.65 towards instruments to help in the rehabilitation of prison inmates in Britain. During his recent Edinburgh Festival run, comedian Phill Jupitus performed for the inmates of HMP Edinburgh and donated his fee to Jail Guitar Doors. The prison today received the second of two batches of instruments in time for a series of musical initiatives beginning on 20th September. Following the recent visit to HMP Wandsworth, discussions have begun with staff about the possibility of opening a guitar repair shop in the prison, with luthiers from Surrey Strings training inmates to repair and set-up instruments donated to Jail Guitar Doors. 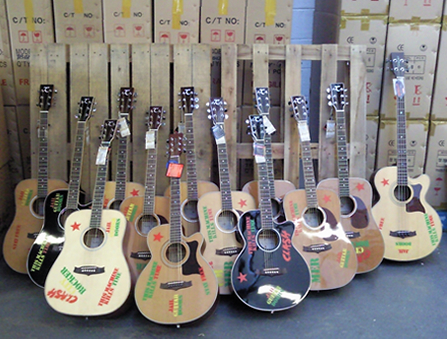 These guitars, donated by individuals, can then be distributed to other prisons. Jail Guitar Doors today linked up with Surrey Strings to present eight recycled guitars and one JGD special to the inmates of HMP Wandsworth in south London. Running a guitar workshop just up the road from the prison, Surrey Strings specialise in repairing old guitars and donating them to charity. While on the premises, Billy was interviewed by Radio Wanno, the inmates' radio station. Q: What would you call someone inspired by Joe Strummer who does gigs in prisons? A: Johnny Clash. That’s the name that Billy Bragg has adopted for a benefit single aimed at raising funds for his Jail Guitar Doors initiative. 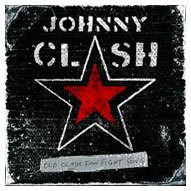 Billy returns to the raw solo style which first made his name, releasing a 7-inch vinyl single of ‘Old Clash Fan Fight Song’ backed with ‘The Big Lie’ on 20 August, 2007, available at billybragg.co.uk for £1.99 plus p&p. Click here to order the single NOW!. In his book The Progressive Patriot, Billy Bragg recounted how The Clash inspired him by nailing their colours to the Rock Against Racism flag back in 1978. Thirty years later, those teenage Clash fans are now in the front line of the battle against the BNP. “Time and time again,” says Billy of the members of his generation who are actively opposing the racist right “you find that its old Clash fans who are leading the charge. Although we may have hung up our leather jackets, those of us who were touched by the fire of punk have held onto our anti-fascist ideals. ‘Old Clash Fan Fight Song’ is a rallying call to this generation – and those that have followed – to take up the fight once again. £1 from each copy sold will go to benefit Jail Guitar Doors, an initiative set up by Billy to provide guitars for rehabilitation work in British prisons. The first donation made to the fund came from Clash guitarist Mick Jones, who recently accompanied Bragg to Wormwood Scrubs Prison in west London to deliver half a dozen guitars to the inmates there. Every 50 singles sold will buy another guitar. 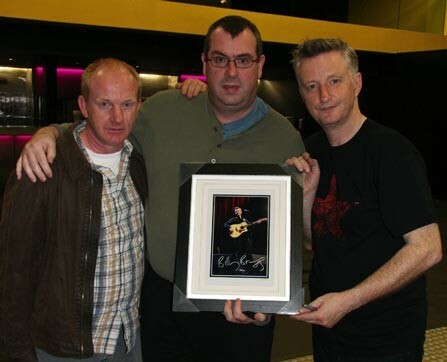 Click here to join in the Jail Guitar Doors discussion at the Billy Bragg Forum. Americans inspired by Billy’s Jail Guitar Doors initiative are organising a benefit concert in Alexandria, VA, on 19 August. The DC Acoustic Underground and Prisons Foundation will raise money to buy acoustic guitars for a pilot programme to be run in the Crisis Intervention Unit at the Montgomery County Corrections Facility in Boyds, MD. Prisons Foundation, a non-profit organisation based in Washington, DC, promotes the arts and education in prison and alternatives to incarceration and operates the Prison Art Gallery in downtown Washington, DC. The DC Acoustic Underground provides venues for musicians and poets to perform and perfect their craft. Like the UK initiative, this co-sponsored event aims to use the power of music to help in the rehabilitation of inmates, and reduce re-offending rates. Featured performers will be local singer/songwriters Lea, Jim Dugan, Dennis Sobin, Michael Yugo and Joe Shade. Dennis Sobin spent 10 years in prison learning classical and jazz guitar and will be appearing at the Kennedy Center in September. Michael Yugo founded the DC Acoustic Underground last year in response to the overwhelming need for more venues for acoustic players. Musical instruments are being provided at cost for the project from Chuck Levin’s Washington Music Center in Wheaton, MD. Admission will be $6 payable at the time of the event, which runs from 1pm to 4pm at the 219 Restaurant. Jail Guitar Doors made its first donation of instruments to a woman’s prison today when Billy delivered six acoustic guitars to HMP Bronzefield, near Staines in south west London. Using £375 donated by an individual supporter, Jail Guitar Doors was able to supply instruments ahead of rehabilitation work by the Changing Tunes charity due to commence in the prison within the next few weeks. Billy was at Shepton Mallet prison in Somerset today to deliver the first batch of equipment purchased with the donations raised at the Glastonbury Festival. Along with the standard six acoustic guitars, the prisoners also received a set of conga drums and various other pieces of percussion. Billy was accompanied by officials of the Fire Brigades Union, who matched the funds donated by the audience at the Left Field. Deadfisch, the anti-war political art/music project founded by artist Andy Bullock has donated a customized guitar to Jail Guitar Doors. Andy presented Billy with the guitar at today’s Spanish Civil War memorial event on London’s South Bank. Billy used the guitar to perform Jarama Valley in honour of the members of the International Brigade who fought against the fascists in the 1930s. The guitar will be among those delivered to the inmates of HMP Bronzefield later this week. See a photo of the guitar decorated by Andy in our gallery. Accompanied by ex-Clash guitarist Mick Jones, Billy delivered the first batch of donated guitars to Wormwood Scrubs prison in west London today. Jones, who wrote the song ‘Jail Guitar Doors’ from which the campaign takes its name, was the first person to promise a donation after Bragg launched the initiative at this years NME Awards. Playing four sets on different stages, Billy’s festival climaxed at the Left Field on Sunday night with a fund raiser for Jail Guitar Doors. The evening began with Alan Miles’ film of the work done by Jail Guitar Doors since its inception at Guy’s Marsh prison in Dorset in February this year. Malcolm Dudley, who originally wrote to Billy with a request for guitars, came onstage and played a song he had written, as did one of the former inmates of Guy’s Marsh, Theone Coleman, who won the crowd over with a song he wrote as part of Malcolm’s workshops. During the evening, one of the guitars that Jail Guitar Doors supply, covered in slogans, was raffled to raise money to be spent in nearby Shepton Mallet Prison. The Fire Brigades Union kindly promised to match the amount raised. This came to £1,127, which means that Shepton Mallet will have more than £2,000 with which to purchase instruments. Four hundred people attended the first ever Jail Guitar Doors benefit gig this weekend at the Fez Club in Reading, Berkshire. The 24 hour music marathon involved 16 bands and raised more than £2000 to be spent on instruments and equipment at the Reading Young Offender Institute. The event was organised by James Ewers and Pete Middleton of the band My Luminaries, who contacted Billy Bragg via the Jail Guitar Doors website asking how they might get involved. Four new Clash-themed T-shirts launched by Philosophy Football for the summer will help raise money for Billy’s Jail Guitar Doors project. The shirts feature designs inspired by classic images such as Paul Simonon smashing his guitar, the Hate and War slogan sprayed on Joe Strummer’s boiler suit, the words from Garageland, and the song English Civil War. A share of the profits from the sale of the Philosophy Football shirts will go towards the initiative and help provide instruments for prison inmates as part of their rehabilitation. Shirt sizes range from Small to XXL, plus skinny-rib.